Panasonic 2017 TVs, 4K, OLED, HDR - everything you need to know | What Hi-Fi? CES 2017 was purely a flagship affair for Panasonic’s TV announcements – a big, headline event for its big, headline TV. That TV was the Panasonic EZ1002 OLED TV, Panasonic’s second-generation OLED set, and a flatscreen panel to follow on from last year’s curved (and hugely expensive) TX-65CZ952B. The only model announced at CES was a 65in version - the TX-65EZ1002 - but a second 77in screen has been revealed at Panasonic's European Convention. That's not all: there's a second OLED range, the EZ952, in 55in and 65in sizes, with a rumoured price of €2499 for the TX-55EZ952. Panasonic has also revealed a new LCD line-up with three 4K HDR ranges and two Full HD/HD Ready series for 2017. All 4K TVs are equipped with an improved My Home Screen 2.0 interface, which takes on the colourful Firefox OS's design and includes new features such as a favourites folders for multiple users, a customisable My App button on the remote, and a revamped Media Player app that supports 4K HDR10 and Hybrid Log Gamma (HLG). HLG support will be available straight out the box for all 2017 4K TVs, but there'll be no support for Dolby Vision HDR for Panasonic's 2017 TVs, or indeed the forthcoming Advanced HDR by Technicolour. There's also a new version of Freeview Play, which Panasonic has refreshed with a Quick Look Guide that shows past, present and future shows for a particular channel, and live thumbnails that show what's being broadcast on other channels. 4K HDR streaming from Netflix, Amazon Prime Video and YouTube are all promised to be on board, too. And finally, Panasonic is joining LG and Sony in ditching curved screens - it's all flatscreens for 2017's TVs. The TX-65EZ1002 (and the new 77in version) is a 4K UHD affair, naturally, and is HDR-capable too, claiming to output the full DCI colour space and more than double the peak brightness of its previous OLED. It will also support the new Hybrid Log Gamma (HLG) HDR variant, used in the BBC’s most recent Planet Earth II 4K trials, alongside HDR10. The EZ1002 will be driven by Panasonic’s Studio Colour HCX2 video processing, which Panasonic says is the most powerful video processing ever incorporated into a consumer TV. 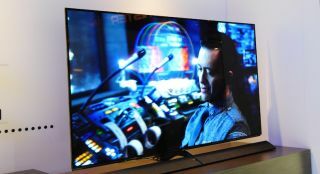 It draws on the company’s professional filmmaking and monitoring expertise, which Panasonic says makes for “the most accurate colours in the TV world”. It’s also equipped with Panasonic’s proprietary Absolute Black Filter, which the company says can absorb ambient light and reflections in order to keep black areas of an image as black as possible. Both of Panasonic's 4K OLED ranges - the EZ1002 and EZ952 (below) - have been certified as Ultra HD Premium from the Ultra HD Alliance. They're also THX certified, and have officially been tuned by colourists and engineers at Deluxe, a creative contents deliver company that works closely with Hollywood. We also know that ISF (Imaging Science Foundation) calibration settings will definitely be built in to the TV, and that users will be able to upload their own colour 3D look-up tables via USB or SD card, for the serious TV tweakers. When it comes to audio, the EZ1002 has been specified and tuned by Panasonic’s legendary Technics subsidiary, and its ‘Dynamic Blade Speaker’ array consists of no fewer than 14 drivers (8 woofers, 4 midrange and a pair of tweeters) underpinned by a passive radiator. They’re integrated into a neat and stylish stand. The EZ952 comes in two sizes: 65in and 55in - the latter of which is rumoured to cost around €2499. The EZ952 features the same OLED screen technology as the EZ1002, promising "unprecedented" black levels and super-accurate colours. Like the EZ1002, it's powered by Panasonic's Studio Colour HXC2 processor, which aims to increase colour accuracy, and supports HDR10 and HLG. The EZ952 also doesn't have the EZ1002's Absolute Black Filter, which aims to minimise reflections on the screen so you get "zero blacks". Panasonic's 2017 LCD line-up consists of three 4K HDR ranges - the EX750 (called EX780 in Europe), EX700 and EX600 - with screen sizes ranging from 40in to 75in. You might notice there are no top-tier models beyond the LCD EX750, but that's because Panasonic will be continuing last year's DX902 and DX802 ranges into 2017. The EX750 will feature the powerful Studio Colour HCX2 video processor found in the 4K OLEDs, while HDR10 and HLG are supported across the 4K range. There's good news for owners of last year's DX902, DX802 and DX750 models - all those screens will get an HLG update as well. There's no timeframe as to when these updates will roll out, but it will be happening later this year. Panasonic has also designed a clever "Swivel and Lift" stand design for select models in the EX750 series, where you can adjust the height and angle of the screen for your preferred viewing angle. Other models incorporate the "Switch Design" with multiple feet positions, which was introduced last year. Last but not least, there are two Full HD and HD Ready ranges in 2017. All screens will feature last year's My Home Screen interface.